A new Conservative government would leave schools in England worse off financially than they currently are, the Institute for Fiscal Studies says. The Tories have promised £4bn extra but this equates to a £1bn rise in real terms, the independent think tank says. When growing pupil numbers are taken into account, investment per pupil will fall 2.8% by 2022, the IFS says. Labour has pledged to increase spending per pupil by 6% over the course of the next Parliament. The IFS says this would require an increase of around £4.8bn in 2017-18 prices. The Liberal Democrats’ plans protect per pupil spending over the course of the Parliament in real terms at the present level (for 2017-18). This would require £2.2bn extra investment. Presently, the schools budget is £40bn a year. Luke Sibieta, associate director at the IFS, said: “”The commitments made by each of the main parties would imply quite different paths for school spending in the next Parliament. “Labour would increase spending per pupil by around 6% after inflation over the course of the Parliament, taking it to just above its previous historic high in 2015. The analysis of the headline figures comes as parents are preparing to hold events in different areas of England to highlight the cash crisis facing schools. The IFS has previously said schools are currently facing the first real terms cut for 20 years. 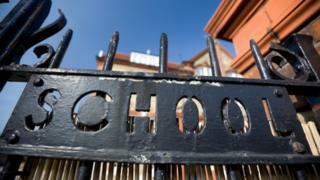 Head teachers have been complaining of the tough decisions they have had to make about staffing and resources.